Born prematurely, with cerebral palsy and vision impairment, swimmer Matt Levy’s combination of determination and hard work has seen him test the limits of his own ability to become one of our best Paralympic athletes. Speaking with Matt Levy, it would be easy to forget that you’re talking to a seven-time Paralympic medallist, world record holder, Order of Australia Medal recipient, children’s charity and Australia day ambassador. 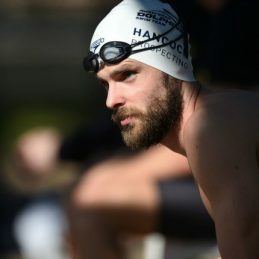 It’s this hard work and determination that has seen Matt become one of Australia’s most successful Paralympic swimmers. His humble spirit and easy-going attitude bely the fact that, beneath the surface, lies an intensely focussed competitor who is determined to make the most of his abilities in the pool – and doesn’t waste a second in chasing his goals. Having recently broken the S7 class world record in the men’s multiclass 200m freestyle, he now has his sights set on the World Championships, kicking off in September 2017 in Mexico City. Matt’s rigorous training regime, sees him up at 4am for a three-hour training session before work. Then he’s back at the pool from 4pm–7pm each night. It’s this hard work and determination that has seen Matt become one of Australia’s best Paralympic swimmers. At age 30, Matt is already a veteran of the sport, with four Paralympic Games and seven medals – including two golds – under his belt. For Matt, success is all about doing what you enjoy – and testing the limits of what you can achieve. He believes that maintaining a positive attitude is essential, and has been working with a hypnotherapist to help him work through his doubts, and develop a template for success. But that’s not to say that Matt is driven only by winning, and he readily admits that part of what he loves about swimming are the opportunities it’s created in his life. Matt also loves that swimming has opened up the chance to travel. When Matt isn’t in the pool, he is an ambassador for children’s charity, Life’s Little Treasures Foundation, which assists families of babies born prematurely. Matt is an inspiring motivational speaker, he shares lessons learnt through his sport and living with cerebral palsy. He also touched on the importance of goal setting and how he maintains the drive and determination needed to overcome life’s challenges and succeed doing what you love. Matt is also an Australia Day ambassador, and has spoken at Australia Day ceremonies around the country. He talks about his journey and learnings through life which include. Being the best you can be, goal setting, perseverance and learning from failures and that every experience is a chance to grow and learn from your mistakes. A truly inspirational man.